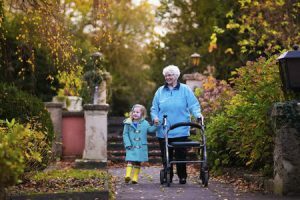 What mobility device is right for you or your loved one? A cane, a walker, a rollator, a wheelchair, a transport chair, a power scooter, or a combination of these? That depends on your needs, your preferences, and your environment. To determine the best solution for you, obtain an evaluation and recommendation from an Occupational Therapist. Occupational Therapists' goals are primarily to foster the greatest level of independence by helping people make their day to day lives more efficient and convenient. Your insurance may cover part or all of the cost of the occupational therapy. A referral from your physician will most likely be required, so ask in advance. Information about Medicare coverage for Occupational Therapy is at this link to Medicare.gov. If you have a Medicare supplement plan (Medigap), it may cover the Medicare deductible and/or Medicare copays. Learn more about Medicare supplement plans at this link to Medicare.gov. Even if your insurance does not cover these services, they will be worth the cost of private payment. Check with the therapist in advance to determine what type of payment sources they accept. This video from Simple Comforts will demonstrate the types of home safety devices that are available. Ask your Occupational Therapist for recommendations of devices and suppliers, and consider whether your insurance will cover the particular device or supplier. Before purchasing a mobility device, investigate your insurance coverage, including Medicare and Medicare supplement (Medigap) insurance. Your insurance may cover only certain types of equipment and only certain suppliers. Medicare will only pay for one mobility device. Therefore, plan to use Medicare for the most expensive one. If a cane is needed now but a walker or wheelchair may be needed later, consider paying for cane using private funds, preserving the Medicare benefit for the more expensive item later. You may have to get prior approval (known as “prior authorization”) for Medicare coverage of certain types of power wheelchairs. Medicare won’t cover a power wheelchair or scooter that’s only needed and used outside of the home. It is important that your mobility device be fitted to its user, and that its user knows you to use it properly. Proper ergonomic use may not be immediately obvious. Rely on your Occupational Therapist to fit the device and to show you how to use it, and consult them again if use is uncomfortable or awkward. Remember to learn what maintenance your device requires and make a note of when to perform it. You can use any Medicare-approved supplier to make repairs to a walker that you currently own. This includes replacement of parts needed for the repair. Concerned that your loved one needs a cane, walker, or wheelchair?